The presidential election of 1936 was a very partisan election for New York, with more than 97.8 percent of the electorate casting votes for either the Democratic Party or the Republican. Roosevelt won his home state by means of a dominance of the massively populated New York City area, performing even more strongly than he had in 1932. Roosevelt took over seventy percent of the vote in the boroughs of Manhattan, Brooklyn, and the Bronx, and took over sixty percent of the vote in Queens and Staten Island. For the era, this was an historically overwhelming victory for a Democratic presidential candidate in the five boroughs of New York City, and enough to easily secure a statewide win for Roosevelt. The emergence of the New Deal Coalition was at its peak in 1936, and made American cities core bases of support for the Democratic Party. 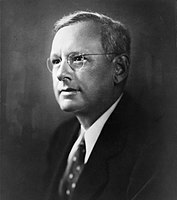 The Great Depression had accelerated the process of urbanization of the Democratic Party which had begun with the election of 1928, and Roosevelt’s landslide win in New York City was a fruit born by this process. 1936 was the third election in a row in which Democrats had won all 5 boroughs of NYC, following 1928 and 1932. After 1936, New York City would remain Democratic overall in every election that has followed, although no presidential candidate would sweep all five boroughs of NYC again until Lyndon Johnson in 1964. Partly as a consequence of this, FDR’s 1936 victory in New York State would also be the strongest statewide Democratic performance ever in terms of both margin and vote share until 1964. In upstate New York, Roosevelt’s support was mostly concentrated in the cities. Roosevelt again carried the state capital of Albany, which since 1928 had become a Democratic stronghold of a city. Nearby Schenectady and Montgomery counties went Democratic as well. In 1936, FDR also managed to flip Erie County into the Democratic column, home to the city of Buffalo in western New York, up to that point a Republican city that had even held for Herbert Hoover in 1932. Finally flipping in 1936, Buffalo has remained a loyal Democratic bastion ever since. Monroe County, home to the city of Rochester, also swung from voting for Hoover in 1932 to Roosevelt in 1936. This page was last edited on 16 January 2019, at 14:25 (UTC).